The sunny and mild weather conditions in the South African West Coast not only makes for great holiday weather but is also amazing for water sport activities and fun in the sun for the whole family. Holiday makers and locals can marvel at the kite filled sky as an array of colours sway overhead, when the ideal weather establishes the kite surfing mecca right here on the Langebaan Lagoon. The splendid sunny spring weather gives life to our annual flower season when the West Coast celebrates the arrival of blissful flowers! 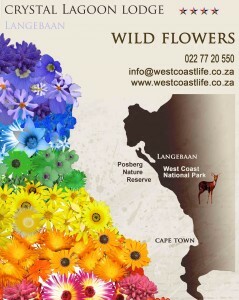 Most of our rainfall happens during the winter months leaving you to soak up to vigor and radiance of the West Coast sun an average of 8.5 hours a day – you will surely have time to explore the charming village of Langebaan and the surrounding quaint fisherman’s villages including Veldrif, Paternoster, St Helena Bay, Saldanha Bay and Jacobs Bay – everything is within driving distance of all West Coast Life beachfront accommodation! Everybody will agree that there is something mouth-watering and magical about the blend of surf, sand and sun – leaving room for endless possibilities!